MINNEAPOLIS -- If you feel like winters "aren't what they used to be around here," you're right, CBS Minnesota reports. New analysis released Thursday by research institute Climate Central shows that, since 1970, average wintertime temperatures in Minnesota and Wisconsin are warming faster than almost any other area of the United States. The U.S. city that experienced the most warming was Burlington, Vermont, where average winter temperatures have risen 7°F in the last 47 years. Winters in the Minneapolis-St. Paul area and the southern Minnesota city of Mankato have warmed 6°F during that period, the second- and third-largest increase among U.S. cities. Fargo, North Dakota has warmed 5.9°F, and Duluth has warmed 5.8°F in the winter during that time. 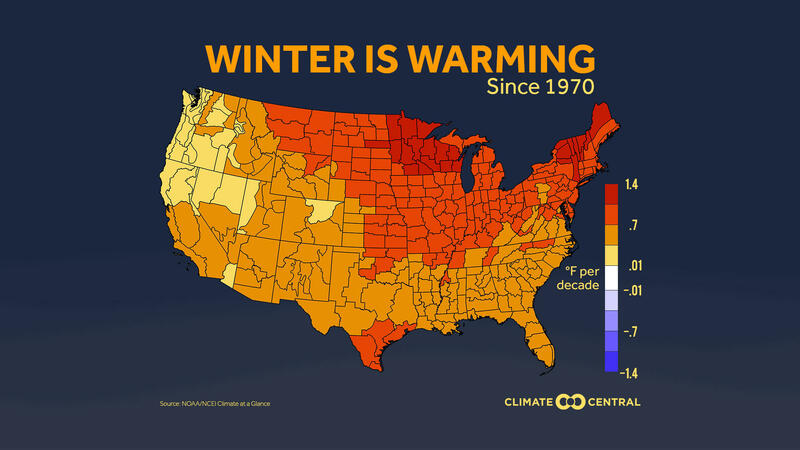 Climate Central also noted that, in general, winter is the fastest-warming season for most of the country. Furthermore, the dramatic winter warming in northern states follows a general rule of climate change that cold areas and seasons warm faster, according to this independent study. In the northeast for example, New York City has seen an increase of 3.2°F over the last 47 years, Washington D.C. has seen a 2.2°F increase and Portland, Maine, has seen a 4.7°F increase since 1970. In Austin, Texas, there has been a 4.1°F increase during the winter months. To arrive at their conclusion, scientists at Climate Central analyzed average temperatures during the months of December, January and February, using publicly available data from the National Center for Environmental Information (NCEI). All of the 344 climate sectors tracked by NCEI showed a wintertime warming trend since 1970 (which is the earliest date for which reliable data is available for all areas). You can read more from the report, and see how other cities are faring, by clicking here. A week ago, CBS Los Angeles reported holiday temperatures were about 20-25 degrees higher than average for this time of year. Thanksgiving Day temperatures were the hottest ever in Los Angeles and at Newport Beach. The noon temperature in downtown L.A. hit 91°F at the official station, at USC. The previous record, 90°F, was set on Nov. 23, 1903, National Weather Service meteorologist Rich Thompson said.